William Hayden English (August 27, 1822 – February 7, 1896) was an American US Representative from Indiana and the Democratic nominee for vice president in 1880. English entered politics at a young age, becoming a part of Jesse D. Bright's conservative faction of the Indiana Democratic Party. After a few years in the federal bureaucracy in Washington beginning in 1845, he returned to Indiana and participated in the state constitutional convention of 1850. He was elected to the Indiana House of Representatives in 1851 and served as its speaker at the age of twenty-nine. After a two-year term in the state house, English represented Indiana in the federal House of Representatives for four terms from 1853 to 1861, working most notably to achieve a compromise on the admission of Kansas as a state. English retired from the House in 1861, but remained involved in party affairs. In the American Civil War he was a War Democrat, supporting the Union war effort. As well as pursuing a political career, he was an author and businessman. He owned an opera house, was president of a bank, and developed many residential properties. English was successful in business, and became one of the wealthiest men in Indiana. After nearly two decades in the private sector, English returned to political life as the Democratic nominee for vice president in 1880. English and his presidential running mate, Winfield Scott Hancock, lost narrowly to their Republican opponents, James A. Garfield and Chester A. Arthur. After leaving the House of Representatives, English had remained in touch with local politics, and served as chairman of the Indiana Democratic Party. His son had been elected to the state house in 1879, and the elder English was still consulted on political matters. Although he had not sought elected office since 1858, he had raised his national profile in 1879 through several interviews and letters to friendly newspapers. 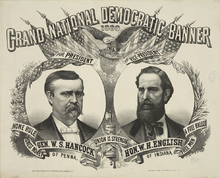 English attended the 1880 Democratic National Convention in Cincinnati as a member of the Indiana delegation, where he favored presidential candidate Thomas F. Bayard of Delaware, whom he admired for his support of the gold standard. The first ballot was inconclusive, with Bayard in second place. Major General Winfield Scott Hancock of Pennsylvania led the voting, and on the second ballot was nominated for President. Hancock and the Democrats expected to carry the Solid South, which, with the disenfranchisement of black Southerners following the end of Reconstruction, was dominated electorally by white Democrats. In addition to the South, the ticket needed to add a few of the Midwestern states to their total to win the election; national elections in that era were largely decided by closely divided states there. The practical differences between the parties were few, and the Republicans were reluctant to attack Hancock personally because of his heroic reputation. The one policy difference the Republicans were able to exploit was a statement in the Democratic platform endorsing "a tariff for revenue only". Garfield's campaign used this statement to paint the Democrats as unsympathetic to the plight of industrial laborers, who supposedly benefited from the high protective tariff then in place. The tariff issue cut Democratic support in industrialized Northern states, which were essential in establishing a Democratic majority. ^ a b c d e f g Commemorative Biography 1908, p. 9. ^ Commemorative Biography 1908, p. 8. ^ a b c d Kennedy, Dillaye & Hill 1880, p. 220. ^ Bright 1934, pp. 370–392. ^ a b Commemorative Biography 1908, p. 17. ^ Van Bolt 1953, pp. 136–139. ^ Van Bolt 1953, p. 141. ^ a b Van Bolt 1953, pp. 155–157. ^ a b c d Commemorative Biography 1908, p. 10. ^ Dubin 1998, p. 164. ^ a b Russel 1963, p. 201 n.38. ^ Commemorative Biography 1908, p. 10; Freehling 1990, p. 559. ^ Elbert 1974, p. 8. ^ a b Commemorative Biography 1908, p. 11. ^ Dubin 1998, p. 181. ^ Commemorative Biography 1908, p. 12. ^ a b c d Commemorative Biography 1908, p. 13. ^ Zeigler 1994, p. 292. ^ a b c Nicholas 1994, p. 545. ^ a b c Commemorative Biography 1908, p. 14. ^ Worth 1994, p. 547. ^ House 1962, p. 184. ^ Clancy 1958, pp. 64–65. ^ Proceedings 1882, p. 99. ^ Jordan 1996, pp. 274–280. ^ a b Jordan 1996, p. 281. ^ Philipp 1917, pp. 43–44; House 1962, p. 185. ^ Proceedings 1882, p. 168. ^ Proceedings 1882, p. 167. ^ Clancy 1958, p. 250. ^ Jordan 1996, pp. 292–296. ^ Jordan 1996, p. 297. ^ a b Jordan 1996, p. 306. ^ a b Commemorative Biography 1908, p. 18. ^ Craig 1998, p. 352. Nicholas, Stacey (1994). "William Hayden English". In Bodenhamer, David J.; Barrows, Robert G. (eds.). The Encyclopedia of Indianapolis. Bloomington, Indiana: Indiana University Press. pp. 544–545. ISBN 0-253-31222-1. Worth, Richard W. (1994). "English Hotel and Opera House". In Bodenhamer, David J.; Barrows, Robert G. (eds.). The Encyclopedia of Indianapolis. Bloomington, Indiana: Indiana University Press. pp. 546–547. ISBN 0-253-31222-1. Zeigler, Connie J. (1994). "Banking Industry". In Bodenhamer, David J.; Barrows, Robert G. (eds.). The Encyclopedia of Indianapolis. Bloomington, Indiana: Indiana University Press. pp. 291–293. ISBN 0-253-31222-1. "Some Letters of Jesse D. Bright to William H. English (1842–1863)". Indiana Magazine of History. 30 (4): 370–392. December 1934. JSTOR 27786698. Craig, Berry (Autumn 1998). "William English Walling: Kentucky's Unknown Civil Rights Hero". The Register of the Kentucky Historical Society. 96 (4): 351–376. JSTOR 23384145. Draegart, Eva (June 1954). "The Fine Arts in Indianapolis, 1875–1880". Indiana Magazine of History. 50 (2): 105–118. JSTOR 27788180. Draegart, Eva (March 1956a). "Cultural History of Indianapolis: The Theater, 1880–1890". Indiana Magazine of History. 52 (1): 21–48. JSTOR 27788327. Draegart, Eva (December 1956b). "Cultural History of Indianapolis: Literature, 1875–1890". Indiana Magazine of History. 52 (4): 343–367. JSTOR 27788390. Elbert, E. Duane (March 1974). "Southern Indiana in the Election of 1860: The Leadership and the Electorate". Indiana Magazine of History. 70 (1): 1–23. JSTOR 27789943. House, Albert V. (September 1962). "The Democratic State Central Committee of Indiana in 1880: A Case Study in Party Tactics and Finance". Indiana Magazine of History. 58 (3): 179–210. JSTOR 27789008. Russel, Robert R. (May 1963). "The Issues in the Congressional Struggle over the Kansas-Nebraska Bill, 1854". The Journal of Southern History. 29 (2): 187–210. doi:10.2307/2205040. JSTOR 2205040. Van Bolt, Roger H. (June 1953). "Indiana in Political Transition, 1851–1853". Indiana Magazine of History. 49 (2): 131–160. JSTOR 27788097. United States Congress. "William Hayden English (id: E000191)". Biographical Directory of the United States Congress. This page was last edited on 16 February 2019, at 10:57 (UTC).